Eat in (indoors or in the outdoor courtyard) from the Mediterranean/California-inflected menu, have a cocktail or shop at the deli for items to go. 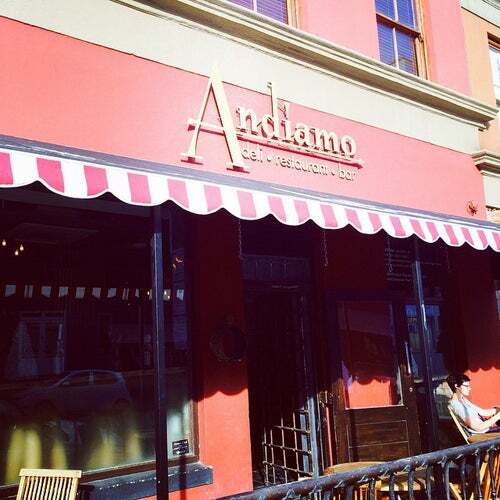 Andiamo, in the Cape Quarter Shopping Center, has both local and imported treats. Your favorite chocolate brand is here, along with Parma ham, Italian olive oil and any other gustatory comfort you might miss. Breakfast until 11:30 a.m. This Italian restaurant was fair at best. The atmosphere is nice; in rhe heart of Cape Town&#039;s gay area. But Andiamo was by far the most mediocre meal we had during our stay. Try the Italian restaurant near Amsterdam New Action. Can&#039;t recall the name, but hard to miss, and superb! I had a Bresaola and Rocket Salad, Mushroom Risotto, and Roast Chicken for dinner, all was perfectly prepared (Risotto can be tricky, but was perfect and creamy) to high-end restaurant quality, but all put in an easy, accessible bistro-style setting with friendly quick staff, and very good value for the price. Part of a large collection of restaurants in an interior Piazza in the Cape Quarter area. Worth the trip. Nice venue and setting for lunch on a warm sunny day. Good menu. Service can be slow.